Discount Magic - Cups and Balls. This is the Classic Cups and Balls trick. The balls mysteriously travel from under one cup to under another cup. 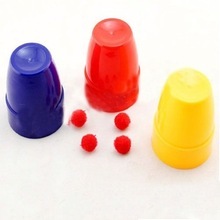 Supplied with three different colour cups and four balls. Each cup stands 2" tall. Complete with instruction.